Life In A House of Blue ! : Uno Moo ! Home > Review > Uno Moo ! I remember many nights when all my family was gather at my grandparents house and all of us sitting at two tables and we would have two games of the classic UNO card game going on for hours. Ever since then UNO has been one of my favorite games. 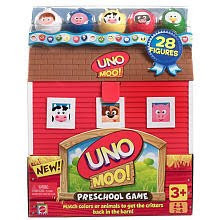 I was thrilled to learn that Mattel has come out with Uno Moo which is a preschool game. 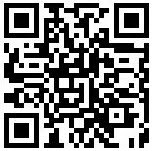 With this game you are matching colors or animals! I think this is a great learning tool besides being a FUN game! When I play with my toddler, one game round does not take long ( about 10 min) . So most of the time it holds his attention, sometimes to play more than one game in a row. As a mom I really like that all the pieces can be stored in the barn, and with the carry handle it is easy to carry. This will come in handy when we go to the fishing camp.....perfect to bring along. Gotta get the critters back in the barn! Round 'em up by matching colors or animals. Is there a blue pig on the roof? Pair it with any blue animal or any color pig. Or use a farmer figure — he's wild and matches anything. The first player to get all their figures back in the barn wins the game! Uno Moo! is a great game for toddlers and preschoolers. It is available in stores nationwide and online at Mattel for $20.99. This is the game of the year for preschoolers! All the moms I know are getting this. I love the original UNO. My kids can follow in my footsteps with UNO MOO. 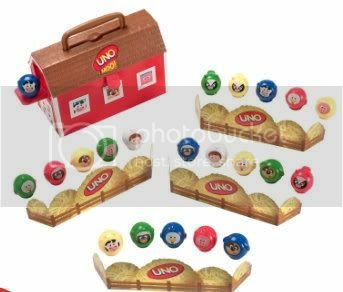 we thought it could not get better than the orginal Uno, WRONG! We are a huge board-game playing family - so far, the only Uno game we DON'T have is Uno attack (I am not too fond of the idea of picking all of those cards off of the floor). I've seen this game, and thought of buying it for my grandchildren (my youngest child is 9), but I'm happy to see your review. Christmas shopping is over, but birthdays are quickly coming up!